Home Unlabelled ASO ROCK IN TROUBLE AS THIS ICON LEADERS MEET! ASO ROCK IN TROUBLE AS THIS ICON LEADERS MEET! 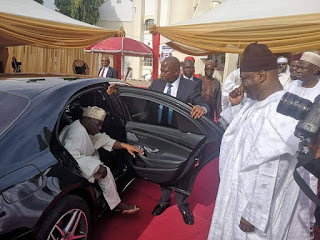 Two former presidents, Olusegun Obasanjo and Goodluck Jonathan, were among the top dignitaries who graced the turbaning of Atiku Abubakar, presidential candidate of the Peoples Democratic Party (PDP), as the 'Wazirin Adamawa' on Sunday. Bukola Saraki, President of the Senate, and Yakubu Dogara, Speaker of the House of Representatives, led a horde of National Assembly members to the occasion. Governors Seriake Dickson (Bayelsa State), Udom Emmanuel (Akwa-Ibom), Aminu Tambuwal (Sokoto State), Ishaku Darius Dickson (Taraba State), Ibrahim Dankwambo (Gombe) and Adulfatah Ahmed of Kwara State were sighted by our reporter. Political coloration betrayed what was meant to be a cultural event, as PDP symbols filled Yola. All major streets were decorated in PDP colors such that one would mistake the state for a PDP-controlled one. Earlier before the turbaning ceremony, and even after it, Peter Obi, Atiku's running mate, anchored sideline political meetings on the need to reassess and to solidify the PDP strategy towards wresting power from the ruling All Progressives Congress (APC). Saraki, Director General of the Atiku Presidential Campaign, took charge of the meeting of PDP presidential aspirants, to perfect the cementing of unity. Tambuwal, Kwankwaso and Dankwambo spoke of their commitment to the Atiku project. Former President Obasanjo, who was a special guest, described Atiku as a well-cultured man who has what it takes to reposition the country. Speaking of his relationship with Atiku, Obasanjo recalled how Atiku handled his duties with deep sense of responsibility. "I have known Atiku for a while, and can state that he handles all responsibilities meticulously," he said. "Let me thank the Lamido on half of all of us who are friends, colleagues and co-workers of Atiku for the honour you have done him by conferring the title of Waziri on him." Former Chairman of DAAR Communications, Raymond Dokpesi, criticised President Muhammadu Buhari, describing the APC as a "party branded in propaganda and lies". "Buhari was marketed to Nigerians on false assumption that as a Major General he has what it takes to end Boko Haram. "But the stack reality is that he does not know what to do; the man was overrated; and let me tell you Buhari has never passed any military exams in his life." Buhari was represented at the event by FCT Minister, Musa Bello, just as Governor Jibrilla Bindow was represented by his Deputy Governor, Martin Babale.